“Big data” enables understanding of patterns and anomalies with far greater speed and accuracy, and has been used to help government make more informed decisions in areas ranging from social service delivery to global threats. Yet while big data has been the source of significant advances, its very nature does not capture deep context about the people and places who benefit from actions taken based on analysis of big data. 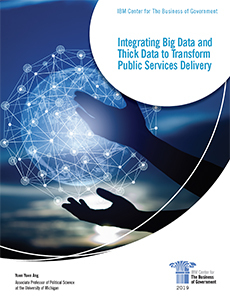 In this report, Professor Ang offers a new framework to enhance government’s ability to leverage big data for social and economic good by integrating the concept of thick data—defined as “rich qualitative information about users, such as their values, goals, and consumption behavior, obtained by observing or interacting with them in their daily lives.” The author reviews the differing strengths and limits of big and thick data, and suggests that governments can improve results by combining the breadth of big data with the depth of thick data—an integrative approach that she calls “mixed analytics,” which can increase accuracy in interpreting big data by adding contextual knowledge about citizen concerns. The report uses three case studies to illustrate how mixed analytics can help improve decision-making that affects the daily lives of citizens across the public sector, at the local, national, and international levels. Professor Ang concludes with a set of lessons learned and recommendations for government leaders, which range from making data and technology relevant to users, and applying big and thick data at different stages of the problem-solving process, to building interdisciplinary teams that include both quantitative and qualitative experts and that engage stakeholders in collecting and analyzing data. This report builds on multiple past IBM Center reports about how government can leverage data and analytics to improve decisions, including Data-Driven Government: The Role of Chief Data Officers, by Jane Wiseman; Ten Actions to Implement Big Data Initiatives: A Study of 65 Cities, by Alfred Ho and Bo McCall, and Realizing The Promise of Big Data, by Kevin DeSouza. The report also complements several chapters that assess the past and potential use of data across the public sector in our recent book, Government For The Future: Reflection and Vision For Tomorrow’s Leaders. View the infographic of the report.